The Hero Worshiper, this Norman Rockwell painting, appeared on the cover of Life Magazine published February 5, 1920. Alternate titles for this illustration are Dog Gazing at Boy and Boy Scout Number. This was the eighteenth cover by Rockwell to appear on Life Magazine. A Rockwell painting appeared six times on Life magazine's cover in 1920 and twenty-eight times in all. 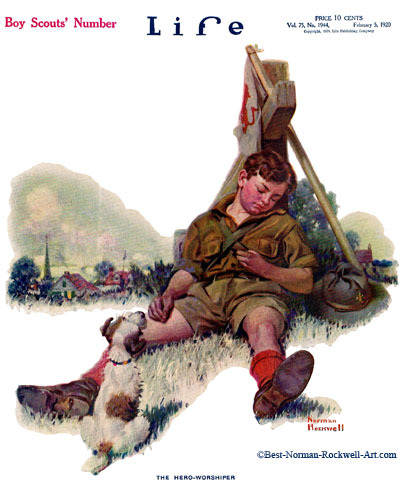 In this Boy Scout Number, Norman Rockwell shows us an exhausted Boy Scout and an admirer. This painting must not have been representative of current events. The Boy Scout is wearing shorts, and the publication date is February. Did the magazine specify what cover they wanted for February? This painting was only one of 28 Norman Rockwell Life magazine covers; here is the list of more Norman Rockwell Life Magazine scans. This Scout is so exhausted that he has removed his hat and fallen asleep. He is leaning against a post and has sprawled out in the grass. He has taken care to prop his troop flag against the post before he succumbed to his fatigue. His faithful friend and admirer, his little dog, is patiently waiting for him to wake up. Did his mother send the dog to wake him and bring him home? Is it supper time already? Or are they both camping out tonight.